These Healthy Almond Flour Pumpkin Cookies are easy to make and perfect for the entire family to enjoy. Sweetened with date sugar. Halloween is just around the corner and I wanted to try a new pumpkin recipe. Did you know that some people actually just buy pumpkins for decoration and after carving, throw away the eatable and best part? Yes! It makes me so sad and I always think: “OMG” what a waste! Pumpkin is so delicious and nutritious. Why not make delicious pumpkin recipes, teach kids where real food comes from, and get some of the many great benefits of pumpkin? Ok guys let me show you a quick, easy to make recipe using pumpkin. Please, please, please don’t throw any pumpkins away…….EVER! These Healthy Almond Flour Pumpkin Cookies Sweetened With Date Sugar are a great example of what you can do with your pumpkin after carving. Cookies that are actually GOOD for you! I tried to use the best ingredients possible and no refined sugars. The results? I am totally in love with my Healthy Almond Flour Pumpkin Cookies. I chose date sugar because it is natural and gives great flavor to any baking recipes. If you are tying to improve your diet, switch to healthier and unrefined ingredients. For this recipe I incorporated top of the line ingredients like almond flour ,coconut oil ,and ghee . The cookies were ready in less than 30 minutes and the smell coming out of the oven was just wonderful for a fall evening. The cookies have a soft texture, I guess making muffins will also work so try it either way. If you want to try regular almond flour cookies, please see my Perfect Almond Flour Chocolate Chip Cookies recipe. There is nothing compared to the smell of homemade cookies coming out of the oven. Something I want my kids to grow up with definitely. Oh, and if you love chocolate, you can make this recipe adding 1/4 cup chocolate chips. Pumpkin desserts go really well with chocolate too. So what are you waiting for? 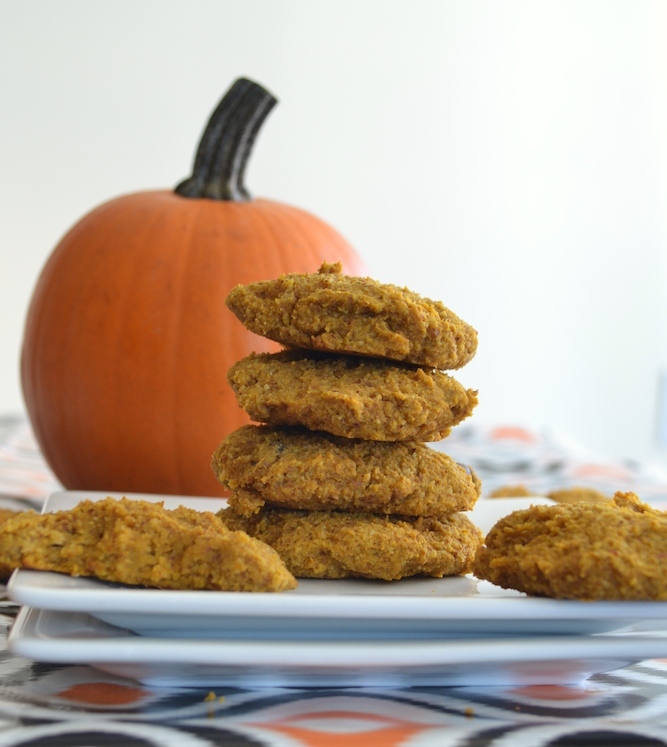 Try this Healthy Almond Flour Pumpkin Cookies recipe and surprise your family and friends with a healthy Halloween treat! These cookies are also great for Halloween school parties (if they don’t have a peanut free policy) or just to share them at home. If you are thinking of throwing a party please see my 5 Healthy Halloween Fun Food Ideas post. Delicious cookies made with no refined sugar and nutritious pumpkin. Perfect baking recipe for the Fall season. In a medium size bowl place the almond flour, baking powder and pinch of salt and mix well. Add the pumpkin puree, egg, date sugar, and vanilla extract and mix well again. Then add the rest of the ingredients. Mix well again. In a cookie baking sheet on top of parchment paper, make round cookies with the dough using your hands. This Healthy Almond Flour Pumpkin Cookies recipe contains affiliate links. The products linked are the products I use and recommend. If you purchase a product through an affiliate link, your cost will be the same but Creative Healthy Family will automatically receive a small commission. Your support is greatly appreciated. These look delicious! I’m going to sub the egg for a flax egg but I will give these a try this weekend. It does not indicate when to add the oil and butter. Why use our hands to make the cookies? Thank you for your comment. I will review the instructions soon. It still doesn’t tell me when to add the butter and coconut oil and this is three years ago! reading through the comments now to figure it out. Also, the ads are totally in the way of your content. So sorry! I will update it ASAP. I have made it both ways, with and without butter and oil. The butter and oil are not required, but it does make the cookies smoother. Also, The cookies do not flatten in the oven. Take wax paper and press down on them before you bake them. Yummm!! These look great and perfect for fall.